Back in the day there was a football game that would become one of greatest of all time. That game was called Tecmo Bowl and changed the video gaming industry forever. Adults of a certain age remember it well and if you really played it way too much like we did, you then discovered that there were some plays that were unstoppable. The most annoying was the pass play to the New York Giants’ Mark Bavaro dragging across the middle of the field. As a defense, there was nothing you could do to stop it. See where I’m going with this? 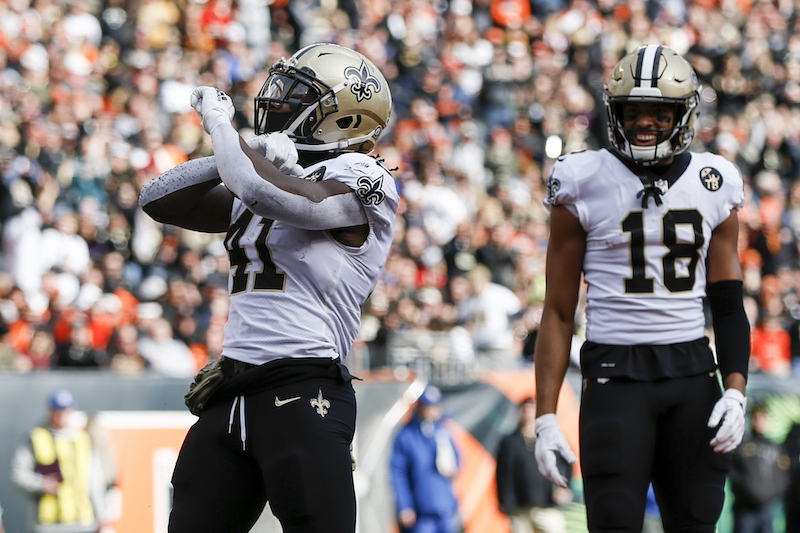 Unfortunately for the Cincinnati Bengals they couldn’t restart the game on Sunday as the New Orleans Saints unleashed a vicious 51-14 beat down on the Bengals, a team that would qualify for the playoffs if the season ended today. The Saints can’t play in cold weather goes the myth. I guess no one told the Bengals as the Saints hit the ground running with a 15-play touchdown drive to kick off the game in a very chilly Cincinnati. The Bengals would drive for a touchdown on their first possession as well but before you could say Cincinnati-style chili it was Mark Ingram off to the races to take a 14-7 lead and the Saints would never look back. The defense would then do to Andy Dalton and the Bengals offense what Sean Payton did to the locker room fire alarm — crush them. The rest of the half would see the opposition punting and the Saints scoring at will. As the seconds counted down on the half, Dalton threw a deep pass into Marcus Williams’ waiting hands at the five-yard line. Williams got up on the good foot and took the pigskin all the way to the Bengals 15-yard line. With seconds on the clock, Drew Brees delivered a pass to Michael Thomas that gave the Saints a 35-7 lead and the party started early for the many fans in Black and Gold that travelled to watch their Saints. Brees threw a near-perfect game, going 22-for-25, 265 yards and three touchdowns in a performance straight out of Tecmo Bowl. Brees passed Brett Favre, and into second, with 509 touchdown passes. Payton Manning is the only one ahead of Brees with 539. The Saints did whatever they wanted, rolling up 509 yards total offense. The rushing attack was back as well, with Ingram leading the charge with 104 yards on the ground on only 13 attempts. Ingram also added 58 yards receiving in his best game of the year. Alvin Kamara put up 92 yards combined and scored two touchdowns to bring his season’s total to 14. Even back up running back Dwayne Washington collected 47 yards as the Saints rested their starters and were content to run the clock out. There is no team better than the Saints right now. Yes, Kansas City is having an amazing year under Patrick Mahomes but this Saints team just keeps getting better and better and is scoring at will. They pulled their starters in the fourth quarter. That’s something that is done in high school games not against professional ball players. In the span of last week’s game versus the L.A. Rams and this week’s first half, the Saints scored 80 points in the six quarters. So, yeah, Kansas City can wait their turn, this New Orleans squad is electric. Their performance over the past four weeks has been amazing, navigating an insanely rough stretch of the season that included wins over the Rams and Minnesota Vikings. What is equally amazing is how relentless their schedule remains. There will be no time to celebrate a job well done with the Philadelphia Eagles coming to town this week. After that it’s a short week before the Atlanta Falcons come to town on Thanksgiving night. A couple of games later the Saints finish the gauntlet of the regular season with a game against the Pittsburgh Steelers sandwiched between two games against the Carolina Panthers. One could hope that the Saints have everything wrapped up before heading into that last week but with the Rams (8-1) still hanging around they may have to play them all to hold onto home field advantage. Out of the last seven games of the regular season, the Saints will have four of them at Dome sweet Dome but that’s down the road and as the saying goes, you just got to play the games one at a time. Or something like that. Nicholls State (7-3) heads into the last week of the regular season controlling their playoff destiny. If the Colonels win at home versus the Southeastern Lions (4-6) they get the automatic qualifier to the FCS Playoffs. They’re tied at the top of the Southland at 6-2 with Incarnate Word, a team that was picked to finish 10th in the conference. Nicholls State beat Incarnate Word 48-21 three weeks ago. Even if the Colonels are unexpectedly upset Thursday night, they have a strong chance of being at at-large selection for the tournament.